Before i came here, i wished to have a white christmas, feel the snowfall in my head and play in the snow, indeed, got all what i wished for my first christmas. I woke up last monday and found out it was snowing for the first time, oh i was so delighted, i got out from the house and took a lot of pictures and my husband took a video of me playing in the snow,.oh i had fun. Then second day was still snowing and same on the third day, my gosh its just too much, almost a week its been snowing now, more and more snow falling and filing up on the ground, and so we cant get out as its dangerous. Now, in 5 days the snow is about 60 cm. 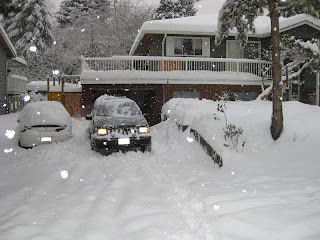 in depth, i've seen several cars stuck up here, even my husband cant drive his pick up truck as we need to shovel as its burried under the snow. 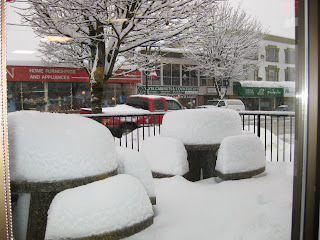 My husband said he never seen like this in BC before, they just had 2 or 3 days of snow and never as bad as this, well, according to the news we had a snow storm this time. Hmmmm.....signs of global warming perhaps? Sure, Its nice to see the snow, its pure white and when you feel it, its soft like a cotton, and the sky is bright during the night too due to the reflection of the snow. But if its as bad as this, i surely want to take back my wishes then, its not fun anymore, you cant get out as its too dangerous, its just so impossible to drive on the road, so it means you cant get out, and my gosh, its super cold too. My husband teased me, that i shouldn't wish for it, i should have wished to win a lottery then. 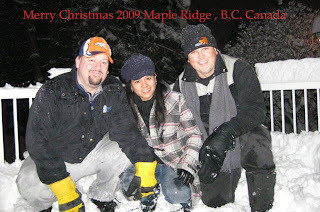 Too bad for my first christmas here in canada. Hope you had a Merry White Christmas! mao jod din. may pa lotto nlng imong gi wish hehe..... gi mingaw ko ni tiger da! "Honey, i'm hungry, lets go to Costco"